This is from the November 2, 2003 program of Meet the Press. "Let me turn to your memo of October 16th, which has been leaked, and share it with our viewers and ask you to talk about it." 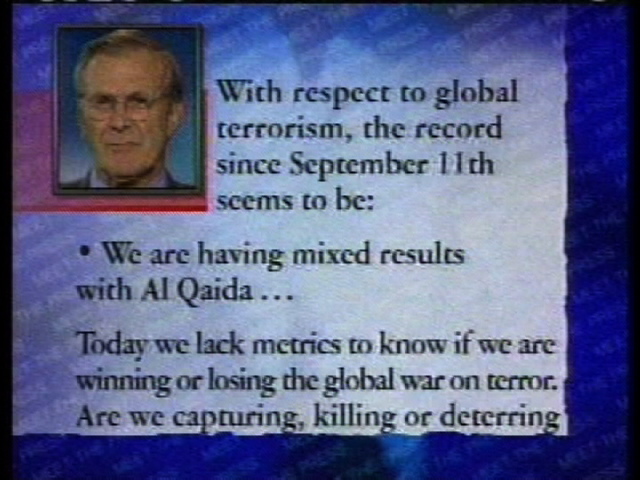 (Russert reading from memo) " 'With respect to global terrorism, the record since September 11th seems to be: "We care having mixed results with Al Qaida..." Today we lack metrics to know if we are winning or losing the global war on terror. Are we capturing, killing or deterring and dissuading more terrorists every day than the madrassas' the schools 'and the radical clerics are recruiting, training and deploying against us?... It is pretty clear that the coalition can win in Afghanistan and Iraq in one way or another, but it will be a long, hard slog.' "
" 'Don't know if we are winning or losing' ??" "Let me explain that. 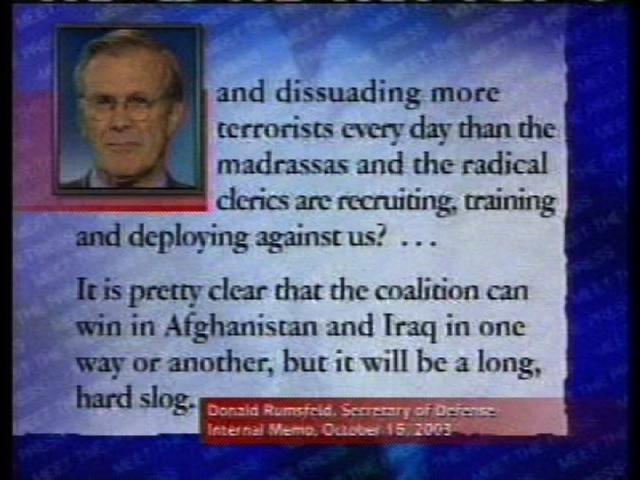 It's not that we don't know if we're winning or losing in Iraq or Afghanistan. We know what's happening there. The point I was making is this. If there are 90 nations engaged in the global war on terrorism, and if they're out arresting, capturing, killing terrorists. If they're out there putting pressure on their bank accounts, making it harder for them to raise money, making it harder for them to transfer money, making it harder for terrorists to move across borders. All of which is true. Good progress is being made. The question is, that I posed, and I don't know the answer, is how many new terrorists are being made. How many of these schools are being led by radical clerics and are teaching people that the thing they should do with their lives is to go out and kill innocent men, women and children to stop progress, to torture people, to prevent women from being involved in their country's activities. How many schools are doing that and how many people are being produced by that? And the question I posed was: you can't know in this battle of ideas how it's coming out unless you have some metric to judge that and there isn't such a metric. It doesn't exist. Therefore, my point was in the memo, that I think we need, the world needs, to think about other things we can do to reduce the number of schools that teach terrorism. Not just continue (stops) we certainly have to continue doing what we're doing in going after terrorists wherever the are, and capturing them and killing them. But I think we also have to think about how we, the world, not just the United States -- this is something well beyond our country or the Department of Defense -- how we reduce the number of people who are becoming terrorists in the world." "Win the hearts and minds."